This is the story of the Bigelow and Hilyard clans, from their first years on America's shores, through the fury of her wars and the glory of her triumphs, to our own time when young Geoff Hilyard must fight to save both his marriage to a Bigelow heir and the windswept coast he loves. It is a struggle that will take him deep into the past, to a centuries-old feud that never died..And on a dangerous quest for a priceless relic of American history that has lain hidden in the Cape for over two hundred years. William Martin is the New York Times bestselling author of ten novels, an award-winning PBS documentary, and a cult classic horror movie, too. His first novel, Back Bay, introduced treasure hunting hero Peter Fallon, who has now appeared in five novels, and spent fourteen weeks on the Times list. SInce then Martin has been telling stories of the great and the anonymous in American history, from the Pilgrims to 9/11. 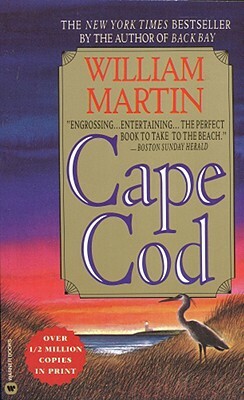 His novels, including Cape Cod, Annapolis, City of Dreams, and The Lincoln Letter, have established him as "a storyteller whose smootness equals his ambition" (Publisher's Weekly). He lives near Boston with his wife and has three grown children. In 2005, he was the recipient of the prestigious New England Book Award, given to "an author whose body of work stands as a significant contribution to the culture of the region."